Punch-Out!! is a game released for the Wii in 2009 by Next Level Games, the developers of Super Mario Strikers and its sequel as well as Luigi's Mansion: Dark Moon. The game stars Little Mac and features Donkey Kong as a bonus opponent. It is the fifth installment of the Punch-Out!! series. Punch-Out!! was reprinted as a Nintendo Selects title in North America in August 28, 2011, and was later re-released on the Wii U Nintendo eShop in North America on January 22, 2015, in Europe on March 12, 2015, in Oceania on March 13, 2015, and in Japan on June 24, 2015. The gameplay is similar to Punch-Out!! on the NES. It has the heart system for stamina and the three star system for Power Punches. This game has various controller settings ranging from the Wii Remote, Wii Balance Board and Nunchuk. In the game, Little Mac, the protagonist of the game, faces a variety of opponents, including Donkey Kong, who appears as a bonus opponent in Little Mac's Last Stand game mode. After being unlocked, he can be faced at any time in Exhibition mode. He is a large, powerful opponent with a variety of taunts. The game started development in 2008, a 15 second trailer was shown. 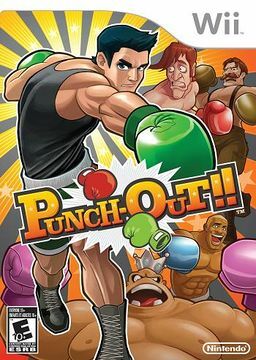 Nintendo wanted to make a new Punch-Out!! game like the original Punch-Out!! for the NES, so they asked Next Level Games to design the gameplay to be like the original game, and the characters to look like their original appearances. This led to the studio designing the game with classic NES-style controls by using the Wii Remote turned sideways. Pre-production started when the Wii was released. At the time, Nintendo was discussing the idea with the studio. Soon after that, the studio created a prototype of the game. Princess Peach was considered to make an appearance in this game as an opponent, but the idea was dropped because Kensuke Tanabe did not like the thought of punching out women in the game. The prospect of punching Mario was similarly off-putting, and while he was included as a referee in the original NES Punch-Out! !, he was left out of the modern title altogether over concerns that his appearance would not work with the game's aesthetics. Instead, Donkey Kong was included as a bonus opponent to represent the Mario franchise. Jī quán rè dòu Punch Heated Fight!! ↑ Good, Owen S. (January 14, 2015). Punch-Out! !, Super Mario Galaxy 2 among Wii titles coming to Wii U as downloads. Polygon. Retrieved January 15, 2015. This page was last edited on February 2, 2019, at 10:42.